If you see a vintage Hamilton watch with a day of the week complication, you'll know it's a 1970s model or younger. Pre-1970 models only had date complications. There are lots of models with day-date options but you need to accept that most of them come with funky chunky 1970's styling. An example of a chunky watch is the 1975 Auto Date Explorer. It was only available in 1975, based on the catalogs, anyway. A lot of gold-colored models were electroplated but the Auto Date Explorer has a gold filled case. My project watch came courtesy of a fellow collector who loves 1970's styling. As you can see in the photo below the watch has seen a lot of use. The back of the case is also gold filled (as opposed to stainless) and should polish up nicely. Did I mention this is a chunky watch? There are a couple of interesting elements when you look at the side. First, notice the line between this lugs - this is clearly a two-piece case. Also, notice the model number for this watch is 911372. The last two digits are usually the year the model was introduced so even though the Explorer only showed up on the 1975 catalog, perhaps it was available earlier, possibly in other markets. Try as I may, I was not able to open the case. I used every trick in the book to no avail. I even went so far as to let the owner know that I wasn't able work on the watch. After a couple of days I gave it another try and I realized the watch actually opens through the crystal. I guess it's a one piece case that was made from two pieces. Once opened, the movement inside is revealed to be a 17 jewel 825 movement with classic ETA styling. Without a beat up crystal blocking the view you can see the dial is in decent shape and it might clean up even better. Under the dial all you can see are the wheels for the day and date. I didn't test the functionality of the watch before taking it apart... someday I will have to start doing that but I usually assume that if it's not working I'll fix it anyway so why bother? However, if I did try the watch first I would likely have found that the date wheel didn't advance and couldn't even be set. One reason is the wheel for the quick change complication has separated from the screw that holds it in place. Most of the parts are now cleared from the front of the main plate and I can flip it over to work on the other side. The first thing to take off the back is the oscillating weight. It's held in place with a single screw in the center. The framework that supports the weight is held in place with two screws that are traditionally blue in color. Now the movement looks like most other ETA-made sweep second movements. A new crystal is definitely in order and a 29.4mm diameter high dome crystal will do the trick. The first parts to go back on are the train wheels. All four need to be lined up before the train bridge will drop into place. Getting the train bridge to fall in place sometimes takes a little finessing and other times it just drops right on. It can be a frustrating task but normally it's not too bad. Notice the ETA grade is stamped onto the main plate. 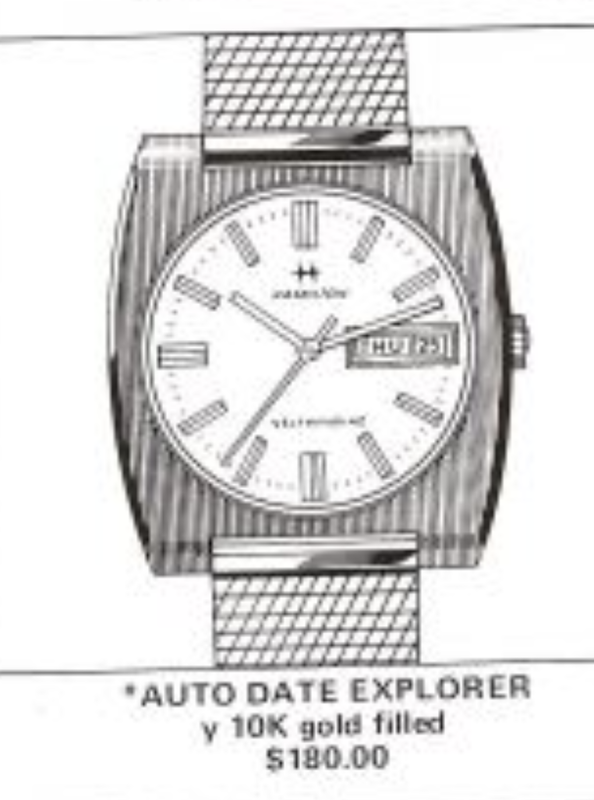 The Hamilton 825 is based on the ETA 2789. Next to go on is the pallet fork and it's bridge. It's better to put the pallet fork on after installing the train wheels, that way the pallet fork won't block the escape wheel when you're trying to get the train bridge to go on. Installing the mainspring barrel and the barrel bridge is a breeze compared to the other parts. Now I can wind the watch and install the balance. The movement is running with a good balance motion so it's off to the timer to listen to the noise it's making. The human ear only hears "tick tick tick" but for every tick tock that we can hear, the timer hears several additional noises. For example, the timer hears the impulse pin hit the pallet fork and then the side of the pallet fork hit the banking pins. Immediately the escape wheel rotates and hits the next pallet fork jewel and the pallet fork hits the impulse jewel again as it pushes the balance away. The timer makes a bunch of calculations based on the noises it hears, compares it to what it expects to hear and then displays the results. This movement is running a little slow at 43 seconds per day slow but the amplitude of 266 degrees is good and the beat error is under 1.0ms - which is great. ETA movements are easy to adjust so I can dial in the performance even better. Now it's right on the money although the amplitude hadn't registered by the time I took the photo. All of the parts go back into the place, including the star-fish shaped wheel in the lower right. Getting the day wheel to set properly is a little tricky since there's a spring-loaded lever to index the day but as long as the wheel sits flush you know it's in place. A new crystal and a little polishing go a long way towards giving this Auto Date Explorer new life. It looks like a completely different watch now, don't you think?